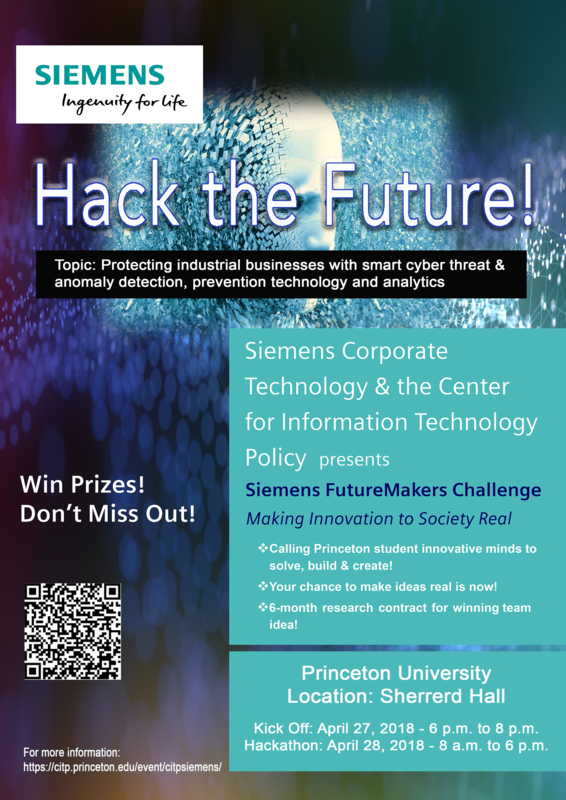 CITP, along with Siemens Corporate Technology, will be hosting a hackathon for Princeton University students on Friday and Saturday, April 27-28, 2018. Topic: Protecting industrial businesses with smart cyber threat & anomaly detection, prevention technology and analytics. Friday, April 27th – 6 p.m. to 8 p.m. – Pizza Party and Kick Off! Saturday, April 28th – 8 a.m. to 6 p.m. – Hackathon and Final Presentations! 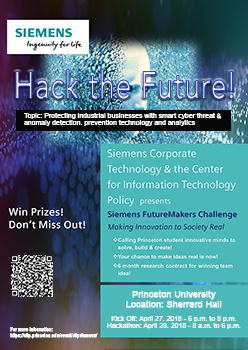 Siemens FutureMakers Challenge: Making Innovation to Society Real is a challenge with a presentation/judging period following the Hackathon. First, second, and third place team members will receive prizes. Plus, there will be an opportunity for a 6-month research contract for the winning team! For additional information, click here.